The Sneaky Upgrade adds widescreen/multi-monitor support and fixes various issues. Includes the Gold Mod, which removes loading zones and fixes mission bugs. Patch v1.1 is the latest retail patch. Digital distribution versions already include this patch. Go to the System folder and open DEFAULT.INI. Go to the [PCStartup] section. A detailed tweak guide for gameplay, graphics and other aspects is available. Includes "Thief 3 Gold", "The Minimalist Project" and "John P.'s texture pack" (all optional). Adds native widescreen/multi-monitor support and fixes compatibility issues. Gold mod removes most of the loading-zones in the levels, expands maps and fixes bugs. Minimalist Project aims to provide an experience more like Thief: The Dark Project and Thief II. Increases the difficulty of the game. Install the Sneaky Upgrade to unlock all resolutions in-game. Install the Sneaky Upgrade and set SneakyTweaker HUD Width to 1.0. Called MultiSampling; also see Use MultiSampling and Bloom together. Disabling can cause lock picking and ladder issues. Refresh rates above 60Hz cause lock picking and ladder issues. Run the game and set your resolution. Go to the SAVES\SaveGames\User Options folder in the installation folder. Change VerticalFOV to the vertical FOV you want and save your changes. No mouse speed option in-game. Mouse speed seems to be also dependent on FPS. If plugged in, a controller can occasionally cause auto-walking. Additionally, a plugged in controller may crash the game if you rebind keys. Open the SneakyTweaker and go to Sneaky Upgrade/Tweaks. Change the Mouse Sensitivity Factor to your liking, with 1.0 being the default value. Press Apply and start the game. Subtitles for all speech (disabled by default). This problem occurs on multi-core systems and is fixed by the Sneaky Upgrade. This is caused by high frame rates; enable Vsync and use a refresh rate no higher than 60 Hz. Ensure your in-game resolution has a refresh rate no higher than 60Hz. If problems persist disable Vsync in-game and force in the graphics card control panel instead. Lowering the game's resolution is reported to have solved this issue for some users. Run the Sneaky Upgrade installer. When shown the installation options, enable the desktop effects fix. Continue installing normally. The game will now load without interruption. A black screen may be seen momentarily at the start of loading a save when switching resolution. 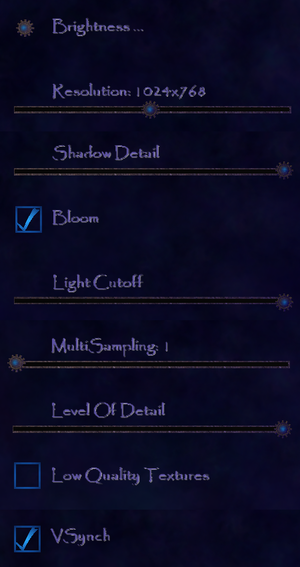 Deadly Shadows doesn't allow you to set both MultiSampling and Bloom in-game; enabling either will disable the other one. Enable Bloom in-game (leaving MultiSampling disabled). 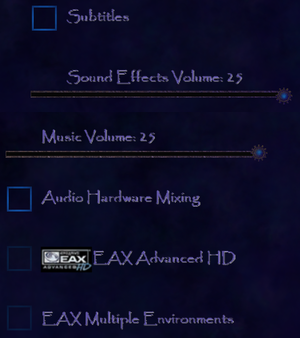 Force anti-aliasing through your graphics card's control panel. Both effects will now display together. Use the Ambient Occlusion flag 0x0000001E with Quality or High Quality. Install the Sneaky Upgrade and enable the 'Mouse Improvements' option. 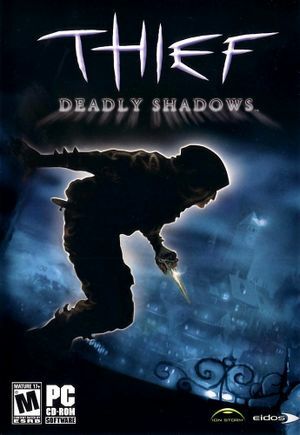 Under Profiles select Thief 3 Deadly Shadows. Under Ambient Occlusion compatibility insert the flag 0x0000001E. Under Ambient Occlusion setting select a quality level. In order to use HBAO+ you must use Quality or High Quality. Introduces "bleeding", which affects certain game/HUD elements. ↑ 2.0 2.1 File/folder structure within this directory reflects the path(s) listed for Windows and/or Steam game data (use Wine regedit to access Windows registry paths). Games with Steam Cloud support may store data in ~/.steam/steam/userdata/<user-id>/6980/ in addition to or instead of this directory. The app ID (6980) may differ in some cases. Treat backslashes as forward slashes. See the glossary page for details.